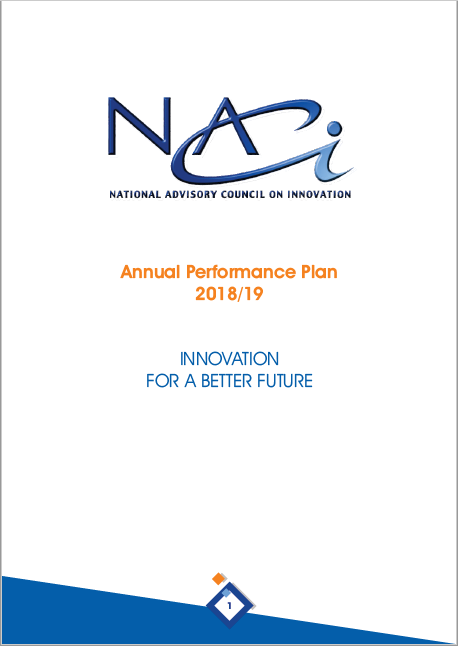 On behalf of the National Advisory Council on Innovation (NACI), I am honoured to present the 2018/19 Annual Performance Plan (APP). This is the last APP for the current Council whose terms ends in July 2018. The Council is implementing its legislative mandate and functions through the 2016-2021 Strategic Plan and Annual Performance Plan. Our 2016-2021 Strategic Plan articulates a vision and identifies strategic outcome-oriented goals that seek to contribute to the realisation of the 2030 National Development Plan vision and Science, Technology and Innovation policy mix (1996 White Paper on Science and Technology and Ten-Year Innovation Plan). Recently, the Council completed the review of the 1996 White Paper on Science and Technology, including a performance analysis of the National System of Innovation (NSI) over a twenty-year period, and submitted its input into the draft new White Paper on STI. exercise whose results will contribute towards the development of decadal plan for STI. Working with partners, the Council will improve phase 1 and develop phase 2 of the National STI Information Portal; and develop monitoring and evaluation framework and system for the NSI. The latter will take into consideration the new White Paper on STI. The Council values the importance of good corporate governance, communication and international engagement. In 2018, the Council will undertake both self-evaluation and external evaluation or institutional review. It will build on the successes of the third Global Forum on National Advisory Councils, which offered an opportunity to establish relations with key actors in the rest of the African Continent. Together with the Department of Science and Technology Communication Unit, NACI will work hard to implement its communication plan. I therefore commend our APP to South African citizens and NSI role players, in particular.